Igbo people are predominantly native to south eastern and south southern Nigeria and are one of the three major tribes in the country. Igbo people has the highest number of traditional food and the most delicious food in the country. For traveler and tourist who wish to pay a visit to Igbo land, i will be sharing with you all Ten soups you cant afford to miss upon your visit to Igbo land. These soup can be taken with Pounded Yam, Semolina, Garri, Akpu (fufu) etc. Ofe Okra is undoubtedly the cheapest Igbo soup, one of the most popular, one of the most delicious, nutritious, mouth-watering and finger-licking soups in in igbo land. Ofe Okra is most preferred not just because of its taste but also because it is very easy to prepare. Ofe Egusi is a popular Igbo soup made from melon seeds. Ofe Egusi is not peculiar to any Igbo sub group or state as the soup is prepared in so may ways by different Igbo state or sub group but aside the general way of preparing Ofe Egusi, The Abians prepare Egusi in different way called Akpuruakpu Egusi. Ofe Onugbu is a popular soup of Igbo tribe of Eastern Nigeria. although Ofe Onugbu cut across the entire Igbo land, it is more peculiar to the Igbo people of Anambra and Enugu State. Onugbu is the Igbo word for Bitter-leaf, although the name of the soup is bitter leaf soup, the soup itself is not bitter at all because the leaf must be thoroughly washed to get rid of the bitterness before it is used. Ofe Oha is one of the most popular Igbo soup, it is consumes throughout the length and breath of Igbo land but more popular among the people of Enugu where the oha tree grows the most. Ogbono is definitely one of the most delicious, nutritious and mouth-watering soups of the Igbo people. Ogbono seeds which give the soup its name is gotten from two different trees, the Adu tree and the Ugiri tree but the Ogbono gotten from the Adu tree is more popular and more expensive than that of ugiri. Ofe Nsala is a very mouth-watering white soup indigenous to the people of Eastern and Riverline areas of Nigeria. ofe nsala is very a tasty and quite easy to make, ofe nsala is mainly prepared for nursing mothers although its open to every one, this delicacy is traditionally made without the use of palm oil as compared to other Igbo soups that require red palm oil as one of its main ingredients. The total absence of the palm oil is what makes this dish so appealing to new mothers. Ofe Akwu is a very popular soup of Igbo people of South Eastern and south southern parts of Nigeria. In the South Eastern parts of Nigeria, ofe akwu is used mainly as stew and eaten with white rice while our brothers at the other side of the river niger commonly eat ofe akwu which they also refer as banga soup can be taken with various fufu recipes such as, Starch, Pounded Yam, Semolina, Garri and Cassava Fufu. Ofe Owerri is one of the most popular soup of the Igbo people and the expensive too. Ofe Owerri is more peculiar to the owerri people where it got it name from, ofe owerri is made with assorted meat like cow meat, snails, dried fish, stock fish etc. 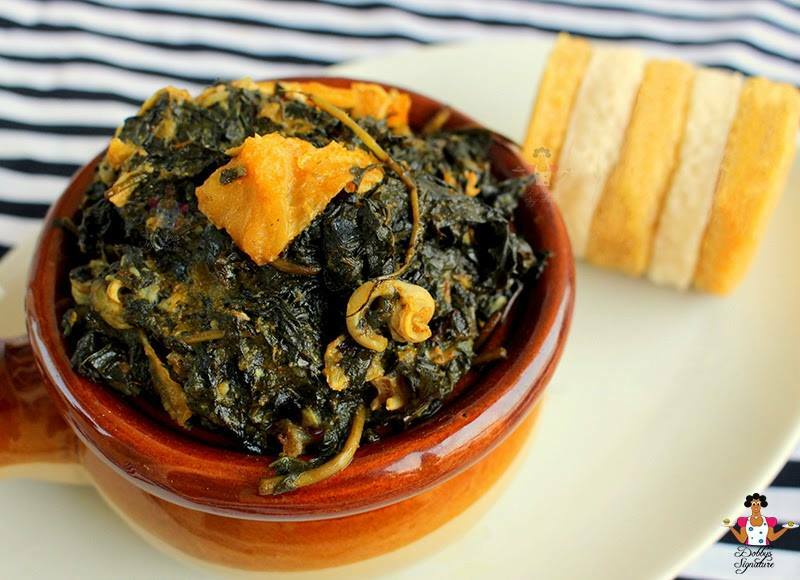 Ofe Okazi is an Igbo soup made from the okazi leave and ugu . This delicious meal can be prepared in different ways depending on the state, while some prefer to use both ugu leave and okazi leave in preparing the soup, some prefer to use just the okazi leave. which ever way the okazi soup is prepared it can not be called okazi if the okazi leave is not used in the preparation. okazi is prepared with assorted fish, meat, spices and a soup thickener which can be either ofor, achi or ede. Ofe Achara is a popular soup among the Igbo tribe of Nigeria especially those of Abia, part of Ebonyi, Enugu and Imo state. Ofe Achara is cooked with lots of ingredients but what makes it special is the Achala plant which give it the name Ofe Achara (Achara soup). Looks hearty! Thanks for sharing! ogbono and egusi is one of my best soup. i don’t joke with it. nice work here about nigeria soup. I love all these soup but my favorite of them all is Egusi. I ma so hungry and tgose look so tasty! These Igbo Soups look really delicious! Do you have recipes to all or at least one of them? I would either like to make them or try them myself! 🙂 I, unfortunately, have never tasted them before. The colors here are wonderful! I’m not familiar with Nigerian cuisine but these look amazing. Never heard of these soups before. All are tempting. Gonna try Ofe soup this weekend. This looks like such a hearty and delicious meal! I will have to try it! All the soups look delicious! I have never tasted Nigerian cuisine but would love to try some day. Thanks for sharing. Never heard of Igbo food leave alone trying. Though I will like to try them because they look yum. Reading your top 10 Igbo soups is totally making me feel hungry, and it’s lunch time here in Manila! Wow they all look delicious! I’ll need more rice for these. Such an interesting list of soups/stews! Please can you do another post and explain what’s in all of them or some recipes! This is such an interesting post indeed. The soups all sound really unique and delicious. Wow thank you for sharing all the popular Igbo soups. I love the Ofe Akwu soup becaus of the use of yams and cassava. Sounds so good. They look so hearty and filling. Perfect for the weather we’ve been having lately!